Ngwenya Mines is part of the Tentative list of Eswatini in order to qualify for inclusion in the World Heritage List. The old mines of Ngwenya, inactive since 2017, claim to be the oldest mine in the world. This is because the San people used to come here to scrape iron off the rocks for those rock paintings you may have seen in other areas (including Drakensberg), as well as sunscreen would you believe it. The guide used it for his hand and says he uses is every time he comes here on a tour. Arriving at 08:00 when they open the gate (actually I opened it but the guy came down the road a few minutes later anyway), I paid the entrance fee of 30 Rand (equals to 30 emalangeni but I didn't have any) and we drove up to the visitor center with my car. The ticket price includes a tour guide which is really great. The park also has game so you could technically pay just park entrance fee and see everything by yourself but it wouldn't be very insightful. As usually there are two staff on hand it isn't a problem if he leaves but at the moment he is alone and he actually unmanned the booth and any tourists arriving after me would have to wait for 90 minutes. I thus strongly suggest to be there at 08:00 as well. 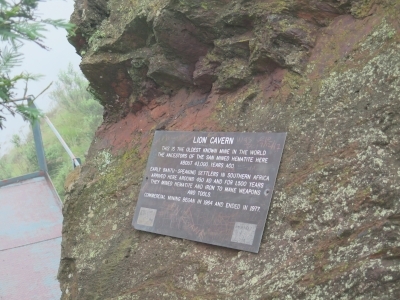 The tour is quite long because it involves some light hiking to the Lion Cavern. The visitor center unfortunately burnt down in September last year. The first stop is in front of it nethertheless to view the old Ngwenya mining pit. I had a very foggy day and the pictures online are a thousand times better than what I shot. Anyway this isn't special because this was used for modern iron mining. The main point of interest is the Lion Cavern which is one of four caverns still in existence. The other 3 were destroyed by recent mining, shocking as it is. The entire area is full off rusty iron and I can understand how it is easy and valuable to take the entire rock outcrop. There was supposed to be mining activity until 2019 by an Indian company but it stopped a couple of years earlier due to lack of returns. This is one of the reasons though, that I find the site can't be considered as a WHS. A mine would have to be completely shut down and not have mining equipment laying about. It wouldn't be hard to clean up and eliminate future contracts but the site isn't ready for that yet. Perhaps only the Lion Cavern is, but I find the evidence is lacking that this iron is EXACTLY the ones used for rock art. If so then maybe. The Ngwenya Mines comprise the only entry on the Tentative List of Swaziland, a country without a proper WHS so far. The site has been lingering on that list already since 2008. It claims to be the “oldest mine in the world”. Its iron ore deposits were worked at least 42,000 years ago, when red haematite and specularite (sparkling ores) were extracted by the forefathers of ancient San Bushmen. The mining history of Ngwenya further consists of early iron smelting by the Bantu from 400 AD on and the ‘modern’ mining of the 20th century by foreign companies. I entered Swaziland by rental car from South Africa, crossing the border at Oshoek. The turn-off for the ‘Old Ngwenya Mine’ lies right after the border crossing. It is signposted well. After a few kilometers uphill drive I arrived at the gate to the Malolotja Nature Reserve, of which the former mines now are a part of. A ranger welcomed me, collected the 28 Rand entrance fee and jumped into the passenger seat so we could drive further up to the mine itself. The first view of the mine pit is quite spectacular. Although the stepped walls made during the blasting process are still visible, the hole is now almost fully covered by trees and bushes. Since the mine closed in 1977, nature has had almost 40 years to win back its territory. Mammals have returned, mostly monkeys. All historic mining stages are represented at the visitor center, which lies next to the first viewpoint. It has one room of exhibitions, showing the geology, the iron tools (including shackles and spears) made by the Bantu and a machine from early 20th century England. There are also photos of how the mine looked like right after the mining stopped: so totally different from now, only bare ground with chunks ‘eaten away’ by the heavy equipment. We got into the car again for a visit to the Lion Cavern, which is where the earliest traces of mining have been found. Access is from the other end of the large pit, an old gravel road circumvents it. From the car parking over there it’s another 10 – 15 minute uphill walk to reach the cave. There are very fine views over the rolling hills of Swaziland from up there. 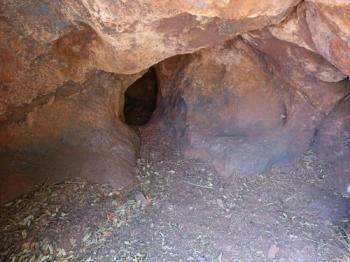 A wooden staircase leads to the cave itself. It’s very small and also very red. The guide tells that people from the territory below were probably attracted by the red colouring. They started using the iron dust for cave paintings and sun protection. He smeared some of it on the back of my hand, and indeed it has an amazing deep red colour and a glittery effect. Mining has been going on intermittently in this region. Although this ‘old mine’ now has closed, another one has opened up more to the north in the Malolotja Nature Reserve. Considering the involvement of even the Swazi king, I guess the economical benefits of the mines will take precedent above a possible World Heritage status. I was pleasantly surprised though by the professional demeanour of the guide and the care that has obviously gone into the visitor center. With some 10-20 tourists a day (plus the odd school group during the season), it does see a steady trickle of visitors just strong enough to keep it going.